Democracy & the Environment are being threatened at the OHIO Statehouse! Local democracy is being threatened at the Statehouse! Ohio Senate Bill 210 would prevent cities from placing a fee on items, such as single-use plastic bags and bottles, as a means to discourage overuse. A minimal charge for bags and bottles has proven to be an effective disincentive to wasteful over-consumption. Senate Bill 210 would take away a city’s right to address pollution as it sees fit and instead take a broad brush approach determined by the state. Local governments should have the power to decide what is best for their own community. Keep local democracy in Ohio! Why is a bill being proposed in Ohio, a state with no current plastic-bag fees? Because Big Oil and Gas is coming to Ohio and wants to sell plastic! Ohio’s Utica Shale region contains a vast amount of ‘wet’ natural gas that is perfect for making plastic pellets. Five proposed ethane crackers are coming to the Ohio River Valley, with the goal of producing 7 million metric tons of plastic pellets per year. The future of Ohio’s environment and human health are at great risk! Take action today, say no to SB210! Recommended by Kirsten and Jurgen Pape. Dan Egan is a reporter at the Milwaukee Journal Sentinel and a senior water policy fellow at the University of Wisconsin-Milwaukee’s School of Freshwater Sciences. 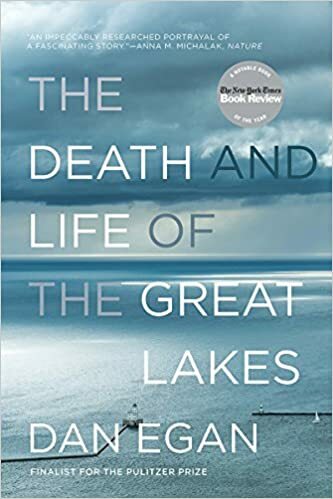 He has twice been a finalist for the Pulitzer Prize, and he has won the Alfred I. duPont–Columbia University Award, John B. Oakes Award, AAAS Kavli Science Journalism Award, and J. Anthony Lukas Work-in-Progress Award. A graduate of the Columbia Journalism School, he lives in Milwaukee with his wife and children. A message from Arnold Schwarzenegger: Trump, let coal go! How much longer will we let corporations and their hack politicians poison us for profit? On May 15, 2018, a committee in the Ohio House of Representatives voted House Bill 393 out of committee for a floor vote. HB 393 would prohibit any regulation whatsoever of the sales of fracking radioactive waste which is misleadingly labeled “brine”. Please read the letter below from attorney Terry Lodge and then call the members of the Senate Energy Committee in opposition of this dangerous bill. “Friends, I want to tell you the very disturbing news of a new corporate-driven scheme to poison you, your family and your pets with radioactive waste. Here’s how I know Aqua Salina is radioactive waste. Scientists at the Ohio Department of Natural Resources – an agency generally viewed as owned by Ohio’s oil and gas industry, analyzed Aqua Salina in 2017. I’ve attached their report. Samples of Aqua Salina bought right off the shelf ranged as high as 500 times background radiation in Radium-226 and -228. The average of the samples tested by ODNR were 300 times federal drinking water limits for Radium-226. Why is any of this significant? Well, those of you who know me know that I’ve litigated against fracking for years. And I’ve learned that oil and gas drilling, using fracking pulls enormous amounts of radium to the surface, mostly in liquid form. Radium-226 is a major radioisotope in the liquid and solid drilling wastes brought to surface to get natural gas and oil. Ra-226 is especially dangerous because unlike a lot of radioactive isotopes, it dissolves readily in water. If you drink water containing Ra-226, the body incorrectly recognizes it is as dissolved calcium and deposits it in bone tissue. Ra-226 is an “alpha particle emitter,” meaning that an atom of it is energetic enough that it will electrically bombard surrounding cell tissues and cause cell mutations. Cell mutations often become cancers, also called blastomas. Ra-226 causes bone cancer. In fact, radon gas – radium in gas form – is the second leading cause of lung cancer in the U.S. We all know the first leading cause of lung cancer is smoking, but few people know that the tobacco plant concentrates Ra-226 as it takes up nutrients from the soil. Smoking involves inhalation of Radium-226. On May 15, 2018, a committee in the Ohio House of Representatives voted House Bill 393 out of committee for a floor vote. HB 393 would prohibit any regulation whatsoever of the sales of fracking radioactive waste which is misleadingly labeled “brine”. And when people finally wake up to the fact that we’re drowning in radioactive deicer and dust control, they will have a huge roadblock to filing suit, courtesy of the Ohio General Assembly. Unless we do something now. This is not just a matter of diluting a little radium in a lot of water. It will take roughly 11,000 years, give or take a decade or so, for all the Ra-226 in Aqua Salina being applied today to roads and sidewalks and driveways to disintegrate down to background levels. And it only takes a few atoms of radium in your drinking water – which, incidentally, cannot for the most part successfully be filtered to remove radium – for the body to deposit Ra-226 in your bone tissues and commence the process of destroying you and your family. So lots and lots of Ra-226 will be washing through Ohio’s surface and subsurface water for the next 11,000 years or so, plenty of time to kill and destroy the health and lives of millions. We don’t need “better regulation” or “ODH regulation” of this poisonous radwaste. It should be flatly and completely illegal to sell it as a commodity at all, with serious criminal penalties. We will not consent to a little poisoning. A little poisoning is more than enough to kill. Whether we work together to stop this – by initiating local and state laws to neutralize the General Assembly and voting the political thieves, brigands and corporate poisoners out of office and by sitting down and sitting in at the Statehouse – whether any of that happens or not is up to you and me. URGENT: The House is voting on Big Ag’s dream bill TODAY! We may only have HOURS left to stop this disastrous bill. Please click here to urge your representative to vote NO on H.R. 2! The House of Representatives is scheduled to vote on the farm bill in just a few hours. As written, this bill would have disastrous effects on our air, water and health. It would roll back clean water protections and pesticide regulations. More than 17,000 activists have already taken action, but it looks like you haven’t yet joined the campaign. It’s now or never. Can we count on you to help stop this bill? Click here to urge your representative to vote against Big Ag’s dream bill! Monsanto and its Big Ag chums are doing everything they can to force this bill through, and we can stop them – but only with your help, Friend. Members of Congress will only vote against this bill if they hear from their constituents today. We need every single voice standing with us if we’re going to shut down this bill. • Roll back clean water protections and pesticide regulations. This bill would allow farmers to spray pesticides straight into waterways, including drinking water sources! • Strip animal welfare protections. The King amendment would roll back existing state laws protecting animals and prevent states from taking further action to safeguard animal welfare. • Hurt hungry families. The proposed bill strips away food assistance benefits for more than 2 million low-income Americans, while expanding loopholes that allow millionaire landowners to stuff their pockets with taxpayer cash. This bill is essentially Monsanto’s wish list of regulatory rollbacks and policy changes. We can’t let it get away with this. The only way to stop this bill and Monsanto is to make sure your representative knows you’ll hold them accountable for their vote. TAKE ACTION: Urge your representative to oppose the proposed farm bill and vote NO on H.R. 2. Thanks for standing with us, Friend. House Bill 393, which could pass out of committee tomorrow, May 15, would encourage the use of drilling wastewater to de-ice roads without sufficient safety protections. Its companion legislation, Senate Bill 165, is also progressing through committee; both bills promote spreading wastewater from oil and gas drilling, which can be radioactive and contain other harmful chemicals, onto roadways across Ohio. Call your legislators today and let them know you have concerns about these bills. Not specific. As it stands, neither bill lays out which chemicals are and are not permitted in solutions used for this purpose. Meaningful controls on this practice should include more specific criteria. Improper oversight. 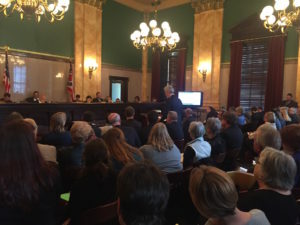 The Ohio Environmental Protection Agency has the appropriate, legitimate jurisdiction and expertise to consider this issue, but these bills assign responsibility to the Ohio Department of Natural Resources. That should be changed to make clear this legislation takes public safety seriously. The exact makeup of drilling solution has been kept secret and can vary, but the process can produce radioactivity, carcinogens, and volatile organic compounds. These bills would introduce controls at the state level on the use of reprocessed brine for ice and dust control on roads, replacing the local restrictions that have taken precedence previously. Standardized rules at the state level could be a positive change, provided they are clearly designed to protect public health and safety. In their current form, HB 393 and SB 165 will encourage the use of drilling wastewater without appropriate health safeguards, leaving possible a risk of groundwater contamination. Contact your legislators and the House committee members below today to tell them these bills must be substantially improved to address these concerns before passing. State senators Dolan and Skindell want to allow fracking wastewater to be used on our roads. But we know that fracking wastewater is rife with toxic substances — making it extremely unsafe. Even worse, we know that wastewater treatment is not always successful. We can’t let fracking wastewater be put on Ohio roads and run the risk of it getting into groundwater. Urge the Ohio legislature to vote NO on SB 165, to protect Ohio’s environment and public health. Go to the link and fill in the letter and form. Solar advocates testify in favor of maintaining a strong renewable portfolio standard. Last year, Ohioans rejected a proposal to extend the freeze of Ohio’s Renewable Portfolio Standard in House Bill 554. At our urging, the governor rejected efforts to hurt Ohio’s solar producers. It was also understood that clean energy policy is also required to advance Ohio’s economy. Not only is solar one of the fastest growing jobs sectors, but employers are looking for stable clean energy policy when investing in a state. A new attempt is underway to make Ohio’s RPS voluntary. The Ohio House of Representatives passed House Bill 114 last spring, and it is now under consideration in an Ohio Senate committee. Solar producers and all Ohioans who care about jobs and clean energy must again speak against this attempt. Ohio remains the only state to have gone backwards on its RPS standard. Let’s not let it happen again. Please, urge your Senator to oppose attempts to reduce the RPS standard through this legislation. Find your State Senator in the “Who to Contact” tab above. I am writing to urge you to oppose HB 114, and its attempt to weaken Ohio’s Renewable Portfolio Standard (RPS). Weakening our RPS would be a mistake. This bill would inhibit Ohioans’ ability to choose where our electricity comes from and cause our state to fall behind in renewable energy job creation. Neighboring states are encouraging economic growth by increasing the amount of renewable energy that powers their states. Now is not the time for Ohio to go backwards. Employers looking to locate in the state are demanding stable clean energy policies. Thousands of Ohioans have made significant investments in solar on their homes and businesses. Changes in the RPS are having a direct impact on the financial return of their investment. Please, reject attempts like HB 114 that will reduce Ohio’s competitiveness and hurt those who have and plan to invest in solar on their property. State bills want to smear fracking waste fluids all over Ohio’s roads for deicer. Act now to stop it. Ohio lawmakers are working on yet another scheme to benefit the oil and gas industry at our expense with Ohio House Bill 393 and Senate Bill 165. It would allow oil and gas waste, including fracking fluids, to be sold as a “commodity.” This means hazardous waste could be sold in stores and spread on our roads as a deicer by the Ohio Department of Transportation. Oil and gas waste is dangerous. Spreading it on roads and highways exposes Ohio communities and waterways to carcinogens and other dangerous chemicals. Sub. HB 393 no longer allows horizontally drilled waste but IS STILL DANGEROUS and must be opposed. Please share this news and new language for making calls and writing letters. Thank you! There’s a new version of the fb post. Please re-send to your circle. Thank you! Sub HB 393: Call on Rep. Edwards to withdraw his support of this dangerous bill! A very dangerous piece of legislation is being considered by the Ohio House. Rep. Jay Edwards supports Sub HB 393, which would allow oil and gas waste to be “processed” for sale in stores for deicing Ohio roads, sidewalks, and even your own front steps. Athens City Council has already passed a resolution opposing the Senate version (SB 165). I urge all Mr. Edwards’ constituents to educate him on the disastrous implications for this dangerous bill. Oil and gas waste is more toxic even than the chemicals used to drill and stimulate wells, as authors of the report cited above documented: Health effects of forty chemicals and heavy metals studied from New Mexico oil and gas waste evaporation pits “produced a health profile even more hazardous than the pattern produced by the drilling and fracking chemicals.” In fact, “98% of the 40 chemicals found in the pits are listed on USEPA’s 2005 CERCLA (Superfund) list and 73% are on the 2006 EPCRA List of Lists of reportable toxic chemicals. Of the nine chemicals found to exceed the New Mexico state limits, all are on the CERCLA list and all but one are on the EPCRA List of Lists. When spread on the ground for deicing or dust control, radioactive dust can become airborne and be inhaled or deposited on crops or pastures, so that humans also ingest it from contaminated produce or animal products. Radium-226 has a half-life of 1,600 years. See also Dr. Julie Weatherington-Rice’s letter to the Energy and Nat. Res. Committee on SB 165 on the extreme dangers of spreading conventional oil and gas waste. Please urge Mr. Edwards to reconsider his support for this dangerous bill, with its fatal implications for Ohioans’ health and wellbeing, ph: (614) 466-2158; rep94@ohiohouse.gov. Thank you. This piece with live links is also posted at acfan.org and a post to share is on acfan’s fb page. Athens County News Covers this issue here. The CEQ chair oversees environmental policy across all federal agencies. But during Senate hearings in November, White struggled to answer basic questions about the CEQ’s role and whether she would use facts in environmental recommendations to the president. She continues to deny that carbon dioxide is harmful to the planet. In her current position at the Texas Public Policy Foundation—a conservative think tank that has received huge donations from fossil fuel interests that include Koch Industries, ExxonMobil and Chevron—White has worked to undermine the Endangered Species Act. Nearly 50 organizations sent a letter to the Senate Committee on Environment and Public Works opposing White’s nomination. The letter expressed support for the Endangered Species Act, which has saved more than 99 percent of species under its protection from extinction and put hundreds of species on the path to recovery. The Trump administration also re-nominated Susan Combs to be assistant secretary of policy management and budget within the U.S. Department of the Interior. Combs—an outspoken opponent of federal endangered species protection—built her career by favoring big corporations and special interests over the needs and survival of imperiled species. Send us issues that need to be addressed immediately.